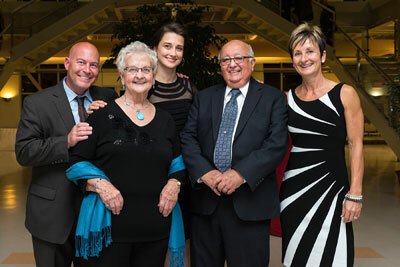 On Thursday, Sept. 24, more than 250 University of New Brunswick alumni, faculty and students along with family and friends held a tribute dinner to celebrate Frank Wilson, the university’s vice-president emeritus of research & international co-operation. Dr. Wilson, a Riverside, New Brunswick native who joined UNB’s faculty of engineering in 1967, co-founded the UNB Transportation Group, which works on improving highway and vehicle safety. He played a key role in expanding the faculty of engineering’s footprint on the Fredericton campus and in making UNB a destination for international students. As an administrator, he helped to create the Muriel McQueen Fergusson Centre for Family Violence Research at UNB and a national network of similar research centres. Dr. Wilson joined UNB’s civil engineering program as a mature student who had already taught in public schools, surveyed for the Maritime Marshlands Administration and helped to establish early warning radar systems in Canada’s far north. He was almost turned away from the university because he lacked a prerequisite course in trigonometry, but UNB President Colin B. Mackay was impressed with him and insisted that he be admitted. After completing his bachelor and master’s degrees at UNB, Dr. Wilson obtained a PhD at the University of Birmingham in England, where he studied as a Beaverbrook Overseas Scholar. He spent one year at the University of Maine before returning to UNB as a professor, where he worked until retirement in 1997. Dr. Wilson has continued to be involved in research and the life of the university. Over the course of his career, Dr. Wilson held three deanships at UNB - a record-breaking number. His contributions changed the landscape and mission of the university. While dean of engineering for eight years, Dr. Wilson was the driving force in getting M. Patrick Gillin Hall built to house the growing faculty, and he oversaw the establishment of 11 funded research chairs in engineering. While serving as the university’s first dean of students, he developed UNB’s Student Health Centre and Counselling Services. During his three years as dean of graduate studies & research, he promoted widespread recognition and appreciation of research in the university community, attracting millions of dollars in new research funding to UNB. As the university’s first vice-president of research & international co-operation from 1992-97, he established UNB as a university with a global reputation for excellence. In each of these roles, Dr. Wilson expanded UNB’s value to the larger community in a variety of ways, from providing shelter to Fredericton-area families left homeless by spring flooding to bringing academic research to bear on issues of public concern. While championing the accomplishments of others at UNB, he also conducted original research that has guided public transportation policy, from the creation of the twinned highway between Fredericton and Moncton to the development of the Fundy Trail. For all these reasons, Dr. Wilson is a well-respected figure among many at UNB, and his thank-you speech at Thursday’s dinner was greeted with a standing ovation. The proceeds from the dinner will be combined with donations from alumni and friends of the university to create the Frank Wilson Scholarship for civil engineering students at UNB. The scholarship will be awarded to a student who is entering the third or fourth year of the bachelor of science in civil engineering degree program at UNB. Students will be selected based on a demonstrated practical interest in civil engineering with due consideration to their financial needs, extracurricular activities, practical potential and ethical standards. To date, alumni and friends have raised $165,000 to honour Dr. Wilson’s legacy and continue his work of helping UNB students to succeed. If you would like to make a donation to the fund, please contact Eric Morgan at 506-458-7956 or eric.morgan@unb.ca. All are welcome to view the tribute videos Frank Wilson: Dean of Everything and Frank Wilson: Family Man.